Symonds claims Singapore GP plot was first suggested by Nelson Piquet Jr.
(CNN) -- Renault's former chief engineer Pat Symonds has spoken of his "eternal regret" at his involvement in the race-fixing conspiracy in last year's Singapore Grand Prix. 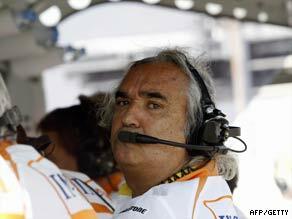 Former Renault chief Flavio Briatore received a life ban on Monday. But Symonds. who has been banned from Formula One for five years, claims driver Nelson Piquet Jr. first hatched the plan to deliberately crash to help teammate Fernando Alonso win the race. Symonds' admission comes in documents released by the Federation Internationale de l'Automobile (FIA) after the World Motor Sport Council (WMSC) special hearing in Paris on Monday. "I was the one who, when the idea was first suggested to me by Nelson Piquet Jr, should have dismissed it immediately," he wrote in a letter of mitigation. "It is to my eternal regret and shame that I did not do so. "I can only say that I did it out of a misguided devotion to my team, and not for any personal gain whatsoever. Symonds, who had been with Renault for over 30 years, and his boss Flavio Briatore were sacked by the long-standing F1 team last week ahead of the special hearing. Briatore was subsequently handed a indefinite suspension while Renault were given a permanent ban, but suspended for two years in recognition of the swift action they had taken in dismissing the pair. In the evidence, released on Wednesday, Renault also appeared to confirm its intention to remain in Formula One, despite the scandal. Part of their written submission stated: "Renault F1 and its parent company have given serious consideration as to whether it should remain in the sport following the prejudice caused to its corporate image by the conspiracy, in addition to the existing background of financial pressures that have caused car manufacturers to withdraw. "But it has concluded that it would like to remain in Formula One and continue to make an important contribution to the sport." Piquet Jr. claimed in his evidence that the pair had called a meeting before the Singapore race and suggested to him that he should crash on a certain part of the circuit so the safety car could be deployed to Alonso's advantage..
Symonds, in a letter of mitigation to the WMSC, insists the idea to crash was "entirely conceived" by Piquet Jr., who was sacked by Renault after disappointing showings this season. The WMSC did not consider who was the initial perpetrator of the scheme, but it has emerged from the released evidence that a secret whistleblower in the Renault team, called 'Witness X' sealed Briatore's fate. They also refused to accept his version of events before ruling he was "personally and directly involved in the planning of the conspiracy," resulting in his life ban. It is an astonishing fall from grace for Briatore, who was one of the most recognizable figures in the high-octane world of F1, while Symonds is left to rue the consequences of his involvement. "In a single action I have destroyed the high reputation I have built up during a 33-year career in motor sport," he wrote. "I am a competitive person who worked in a high pressure environment. This can, at times, cloud one's judgment. "On that night in Singapore last year I made a mistake the consequences of which I could never have imagined at the time."